What Muscles Does Hanging on a Bar Strengthen? Pullups tend to be one of the more challenging exercises. They use your body weight against you and engage multiple muscle groups at once to move your body against gravity. Instead of going straight for a pullup, start by hanging from the pullup bar in a couple of different positions to build the muscles you need to perform a pullup. A straight-arm hang works your hand and wrist flexors, the brachioradialis and extensor carpi radialis muscles in your forearms and the deltoid muscles in your shoulders. It specifically targets the muscles that enhance your grip, which is essential in many exercises, including pullups. Without a strong grip, you won't be able to hold onto the bar well enough to support your body weight. To perform a straight-arm hang, also called a dead hang, grab the bar with both hands in an overhand grip and hang for two minutes -- you might need to build up to this duration. When you can hang for two minutes, switch to an underhand grip to work all your forearm muscles equally. A flex-arm hang often is used in physical fitness tests to evaluate people who can't perform pullups. It requires a strong grip as well as powerful biceps and stabilizing muscles in your upper back. Use a stool or a helper to get you into position, with your hands in an underhand grip, your elbows bent and your chin just above the bar. Hold the position for 10 to 15 seconds, then try again after a 30-second rest. When you master the underhand grip, change to an overhand grip. 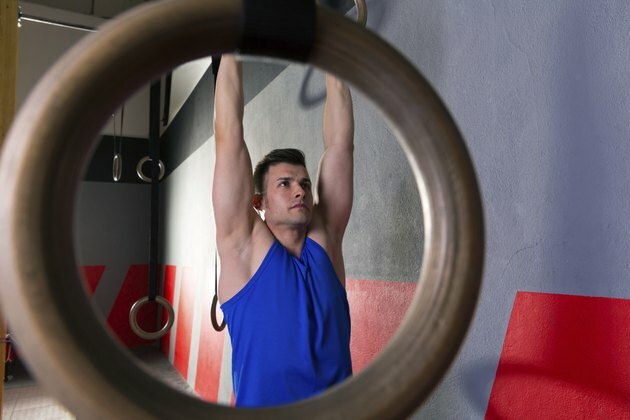 Hanging on a pullup bar can strengthen more than just your grip and your arms. While in a straight-arm hang, shrug your shoulders to engage the hard-to-target trapezius muscles that run across the top of your shoulders to your neck. In the same dead hang, lift your legs in front of you, keeping your knees straight. This targets your abdominals and hip flexors. Mastering the straight-arm and flex-arm hangs helps you progress into pullups by working the necessary muscles, mainly your grip and biceps. Instead of trying a pullup immediately and risking discouragement when you still can't quite complete one, try negative pullups instead. Start in the flex-arm hang position and lower your body with a controlled movement into a straight-arm hang. Keep a step handy to help you get back into the flex-arm hang position, then repeat the process of lowering your body slowly. Shoot for at least five negative pullups that take about 10 seconds each before attempting regular pullups. Can Negative Pull Ups Help? What is Better for Boxing: Pull-Ups or Chin-Ups?